The cover to X-Men Prime. For those who don’t know, ResurrXion is Marvel’s big X-Men/Inhumans push post-Inhumans vs X-Men. If you don’t know what Inhumans vs X-Men was, well, it was exactly like it sounds like: a conflict between the Inhumans and the X-Men, fought because the Inhuman’s Terrigen cloud was killing mutants and the Inhumans were basically dicks and didn’t want to do anything about it. In any case, Medusa finally destroyed the Terrigen cloud, the mutants were free from the metaphorical and literal cloud of extinction over their heads and we are now in a bold, new era of the X-Men. A bold, new era that looks quite a bit like bits and pieces of older eras. Yes, there is a lot of nostalgia going on here. So let’s get started. X-Men: Gold is one of the two flagship books of the X-line (the other being, of course, X-Men: Blue). Why “Gold”? Why not call it Uncanny X-Men like they normally do? Because nostalgia for the ‘90s! It’s all the rage! The premise of the book is simple: Xavier’s School has now been moved back to New York, this time in the middle of Central Park, and the X-Men are back, let by Headmistress Kitty Pryde. There’s Storm, Nightcrawler, Colossus, Old Man Logan, and Prestige (the new name for Rachel Grey). If that looks like a classic Claremont X-Men lineup with “Old Man” thrown before Logan, you aren’t wrong. The writer, Marc Guggenheim, is clearly trying to evoke a ton of Claremont-era stories, as well as Whedon and Cassiday’s Astonishing X-Men (but with less Whedon-y humor). Somehow, however, it still kind of works. The nostalgia never really gets in the way and the stories are still kind of new and the characters pretty much all feel like themselves (aside from Old Man Logan, who seems like Wolverine with some wrinkles). Some characters, like Colossus and Nightcrawler, seem to have reverted back to previous characterizations, however, but Kitty Pryde, as the central character, is well-written. The latest storyline, a tie-in with Secret Empire, which pretty boring, though, with a lame villain, but it did feature a badass moment with Kitty and a katana. The other flagship book, this one following the time-displaced Original Five X-Men (Cyclops, Iceman, Beast, Angel, and new team leader Jean Grey) as they work with Magneto in Madripoor to help mutants around the world. 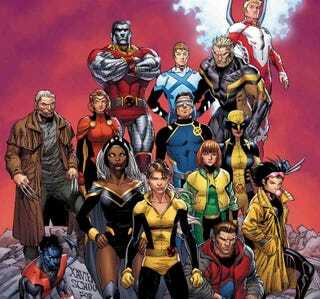 The book, written by Cullen Bunn, is the newest iteration of All-New X-Men with the time-displaced team (originally brought forth by Brian Michael Bendis Bendis). The last volume, written by Dennis Hopeless, was a pretty great road-trip book where four of the five members (minus Jean Grey who was in Extraordinary X-Men) moved around the country and tried to figure things out. This book doesn’t have the same “we’re teenagers who have no idea what to do” vibe to it that the previous books have had, but it still has the same characterizations — a bit more mature Jean Grey, a still obsessive Cyclops, a newly out Iceman, Angel (who, yes, doesn’t really have much characterization as usual), and a Beast who is now learning magic. Yes, Beast is a sorcerer-in-training, something carried over from Hopeless’s All-New X-Men. So far, the plots of the book have been interesting, but the resolutions have been a let down in that there haven’t really been any. Mutant Sentinels were introduced and then disappeared. Characters from the Ultimate Universe appeared and then disappeared again, only leaving behind Jimmy Hudson, Wolverine’s son from the Ultimate Universe. (Do we really need another Wolverine?) The current storyline, a tie-in to Secret Empire, seems to be going somewhere, though, and Bunn does appear to be using characters from his prior run on Magneto and Uncanny X-Men to further the plot, so I’ll wait and see. Now here’s an interesting one: this book isn’t named after the team it’s about, but rather their enemy, the newly reformed Weapon X Program, which now seeks to exterminate all mutants via creating the most advanced cyborgs mixed with mutant DNA. The writer for this series is Greg Pak and, as usual, his writing is on point. All the characters feel like themselves, including Old Man Logan, who always seems to have a wry sense of humor in his old age. And when Pak brings in Amadeus Cho, the story becomes even better, because it’s not just about this group of killers — it’s about this group of killers and someone who is determined to never kill and always save lives. So their moral compasses are entirely opposite each other and that creates conflict, even as they have the same goal (to stop Weapon X). Heck, even the art by Greg Land isn’t that bad, as Pak has worked with land before and knows how to write to Land’s strengths. The only issue, however, is just how long the storyline is going. Right now we’re at part five of the “Weapons of Mutant Destruction” storyline and it’s showing no signs of stopping. Eventually, the ragtag group of killers will stop Weapon X and...then what? Will the book be over? Will they stay as a team (which I really can’t see happening)? Or will Weapon X just restart over and over again (which would get redundant)? In any case, I just realized that Fred van Lente (Greg Pak’s writing partner from Incredible Hercules) is going to be co-writing upcoming issues, so now I’m excited. As another reminder of ‘90s nostalgia, here is Generation X again. But now, Jubilee is the teacher! And she has to try controlling a rowdy class of misfits! While also raising a baby! And being a vampire! Okay, all that happened before the book, but it’s still interesting how they juxtapose that: Jubilee, depowered, but still a vampire, is also a mom to baby Shogo and now a teacher to a class of misfits at Xavier’s School, the mutants that basically don’t fit in anywhere else, which includes Quintin Quire, Eye Boy, Nature Girl, Ben Deeds, Bling!, and new character Hindsight. New writer Christina Strain actually does manage to juggle all these characters, although sometimes the book feels like it’s 90% conversations and 10% fighting. The first two issues were kind of meh on the plot (meh, more Purifiers), but the next two actually brought in an interesting antagonist against the students and it helped the book immensely. The characters, too, all feel like themselves, although we could still use a lot more characterization on some characters, like Eye Boy and Nature Girl. Still, with only four issues out, it’s off to a good start. This is a late-in-the-game third flagship book, this one written by Charles Soule and illustrated by a different artist each issue. Which is kind of a shame, as I loved the art in the first issue done by Jim Cheung. As for the story itself...well, there’s only been on issue so far, so I can’t really judge it yet. I like the team lineup — especially Bishop, who hasn’t been in anything in a while, and the fact that Gambit and Fantomax have formed a kind of buddy-thief dynamic, but it also feels kind of haphazard. Perhaps later story arcs will have different teams. In any case, Charles Soule is a great writer and he knows his characterization, so each character feels like themselves. The villain is an old enemy and there’s a nice twist at the end of the first issue, but beyond that, I can’t judge it because that’s all there is so far. This isn’t a new book — in fact, the book kept the same writer, Tom Taylor, with just a new artist, Leonard Kirk. All it did, really, was rebrand itself. Which is fine with me, because this book is still one of the best books Marvel has published ever. Taylor knows how to write Laura Kinney and his plots and characters intersect so well, it’s, well, uncanny. The “Immune” storyline has been a series highlight in a book full of series highlights. And the side characters, from Gabby (who is adorable) to Nick Fury to Deadpool to freakin’ Daken have all been great and in keeping with all their prior characterization. I don’t know how Tom Taylor does it, really. It would be so easy to get this character wrong or give her bad plotlines, but that never happens. This is simply a great book, through and through. Grade: A+. What did you expect? This book, written by James Robinson, with Carlos Pacheco, seems like it should be a no-brainer. It’s Cable, the mutant with the metal arm and lots of guns (and even more pouches), traveling through time and having adventures. It’s even more ‘90s nostalgia. Unfortunately, of the first two issues that I read, the book just tends to come across as boring. Cable doesn’t say much, his enemies are all random one-dimensional villains from different time periods, and he’s supposedly following a completely different villain through time, but we don’t know who they are or what they want. And since we don’t know who they are or what they want, we don’t care about anything that’s happening. We know Cable isn’t going to die, so why should we care that he’s fighting ninjas? Sure, it looks cool — Carlos Pacheco’s art is amazing, as usual — but the plot is so thin that it’s almost nonexistent and the characterization even less. It’s kind of amazing that Jean has never had a solo book of her own before this book, written by Dennis Hopeless, with art by Victor Ibanez. In any case, Hopeless was a great pick for writer, because he knows how to write a young Jean Grey, having previously written from her point of view in X-Men: Season One and having written the previous (Jean-less) volume of All-New X-Men. The plot itself is simple: Jean has a vision of the Phoenix coming to Earth and so goes on a quest to try and figure out how to stop it from possessing her. Each issue, so far, has been pretty great, although the stand-out issue has to be issue #4, guest-starring the Unworthy Thor. The art itself is awesome, as Victor Ibanez draws a teen Jean as, well, a teen. He never oversexualizes her like some other artists and his action scenes are all outstanding. Eventually, Jean will have to confront the Phoenix, at which point perhaps the book will continue on or perhaps it won’t, but I hope that it does. This book is about the older Bobby Drake, who has taken one step out of the closet and now doesn’t really know what do to next. He’s told some people in his life, but not his ex-girlfriends and certainly not his parents, who are old-fashioned to the extreme. The first two issues were kind of meandering, but third issue picked up immensely and gave us a pretty outstanding issue. Overall, Sina Grace has made Bobby one of the better characterized X-Men, as he layers Bobby with everything that has happened before, while still keeping things pretty light. Another book that’s not a new launch or relaunch, but merely a rebranding, Old Man Logan does, however, have a new writer (Ed Brisson) and artist (Mike Deodata Jr). As for whether or not this series is any good, I have to admit that I haven’t been reading it. I checked out back when Jeff Lemire was writing it and I haven’t read any of the new issues written by Ed Brisson. I do know that they involve the return of the Hulk Gang, which...do we really need to be reminded that they exist? They were the worst part of the original Old Man Logan storyline, so I’m not sure what bringing them into the present day would do. But it also pits Old Man Logan against the Maestro, which might be interesting. Grade: No idea, not reading it. And that’s it. Ten X-books, which is pretty good for the X-line. And now on to the Inhumans.